First post here. 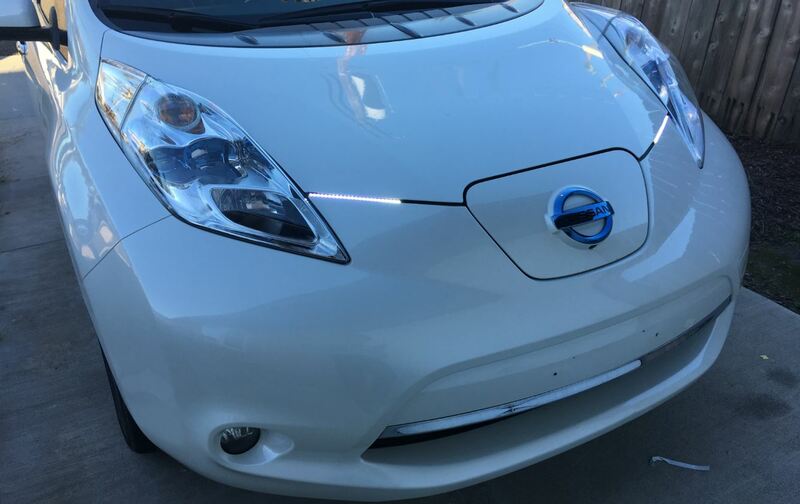 Just got my leaf last week and couldn't do without LED DRLs, followed this guide using these: https://smile.amazon.com/gp/product/B01 ... UTF8&psc=1 (I paid $11) and I think it turned out pretty good. Had a heck of a time with the wire taps though. I went with a bit different of a mounting location due to ease and looks! I like the idea of installing DRL's. The source of where the power is being drawn from I don't understand, why are you not pulling from the lighting relay/fuse panel. Where is a spare fuse slot and relay slot. But end up using Hack splice connectors and wires strung loosely when you can go direct and use wire casings the length of the route? Gun Metal Gray , QC, Open Source 50amp. It seems to me the nicest wiring solution would be Pos to cigarette lighter fuse & neg to headlights. Driving with headlights off, the wire from light switch to bulb is at ground. Resistance through headlights is much lower than through DRL. Voltage drop occurs across DRL. When headlights are on, both leads to the DRL are at nominal 12 V. No voltage drop across DRL and DRL shuts off. I am not sure about impact of LED headlights it might cause them to glow dimly. "2011RedLeaf" It seems to me the nicest wiring solution would be Pos to cigarette [list=]lighter[/list] fuse & neg to headlights. Driving with headlights off, the wire from light switch to bulb is at ground. Resistance through headlights is much lower than through DRL. Voltage drop occurs across DRL. Can confirm this works on a 2013 Leaf SL. I used maxxoverclocker's DRLs from Amazon (repeating the link: https://smile.amazon.com/gp/product/B01 ... UTF8&psc=1). The Red wire and the black and white wire were exactly where GeekEV said they would be. Works great! I was happy to have this guide and used the same LEDs as TheSplash and others. Not being a fan of the typical inline crimps, I used Posi-Taps (also mentioned in this thread, and yes — expensive). I wanted the DRLs to be off when the headlights (or parking lights) are on, so I added a SPDT relay that energizes the relay with the parking light wire near the PDM. (The LEDs are connected to the NC terminal, so they are off when the relay is energized.) Works well. Initially I tried one of the cheap (~$10) DRL controllers on Amazon, but the DC-DC converter voltage is a hair too low for the controller. So the LEDs wouldn't stay on consistently. Rather than try another controller in the hopes of a lower trigger voltage, I just went with a relay. The controller dimmed the LEDs when the head/parking lights were on, which I thought was a cool feature, but not worth unreliable operation to me. Problem here: the black and white wire is not in socket #18, but is in socket #19. Attaching to the black and white is "always on", irrespective of ignition position. Attachment of the light's negative to the chassis ground also results in "always on". The red wire is attached via a tap to the red wire, about 14ga, which is inside #57 on the other plug. I've not found a configuration which controls the led lights via the ignition, as described in the original post. Your advice and guidance will be appreciated. My LEAF is as described in my signature, below. CWO4Mann wrote: Problem here: the black and white wire is not in socket #18, but is in socket #19. Attaching to the black and white is "always on", irrespective of ignition position. Attachment of the light's negative to the chassis ground also results in "always on". The red wire is attached via a tap to the red wire, about 14ga, which is inside #57 on the other plug. I've not found a configuration which controls the led lights via the ignition, as described in the original post. I just did this. Tap into #57 and just grounded on a bolt attached to the body. Lights only go on when ignition is on. Thank you! I'll give it a try. What year is your Leaf? USA Model?